Then after I posted I saw Karen's Sew Primitive post about the Jo Morton club finally starting in Atlanta. She posted pics of 2 quilts that I have made. I changed the colors in both from what she had. I love the little red and cheddar stars! The blue one turned out so good, and so different for me since I never work in blue, that I haven't had the heart to quilt it yet - now is that stupid or what! But I had to add this to the post for Karen to see! If one has to go, I'd get rid of the high contrast 5 red/4 white one onthe side - she is fighting with the others. The second down on the right side is not fitting in with the other colours. You have to quilt your blue one. It is so beautiful. 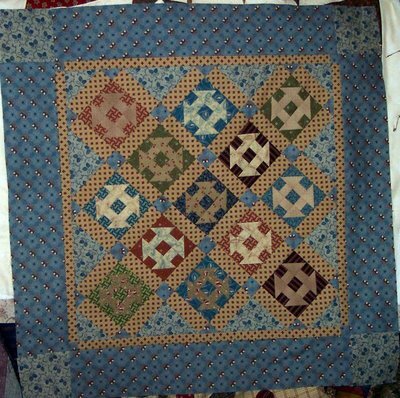 I have not been a blue person, but now I have started to use blue in my quilts and I love it. Your colours is so beautiful in this one. 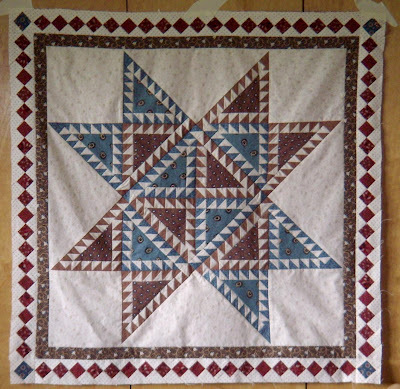 I love stars and this one inspires me using some of my newly bought fabrics. 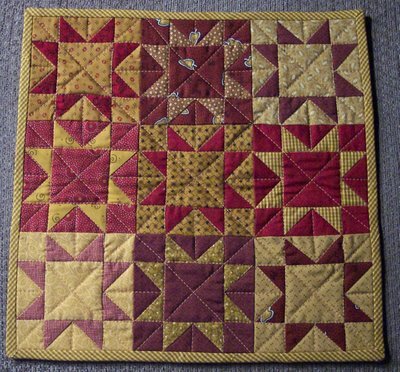 Terrific little quilt show, Dawn! Even your 9-Patches look Jo Morton-like. I'll take the whine and say: "Can't we just keep all 25...pleeeaaaase? I like all of the variance in valuuuuue." My vote is for 4th row, 5th block (red & white). Whichever one you choose, why not incorporate it into the backing? Hey there Dawn, now, I really like all the blocks, but seeing you have to get rid of one ... I'd probably choose the second to bottom on the right. It's very bright compared to the others, and similar in colour to the one at the top on the right. So hard though, they're all individually lovely. I can't tell you which one to eliminate - I like them ALL. :-) They are all great. I love your sewing/applique bag - very pretty and I'm glad that you finally made one for yourself. Don't pick a 9 patch yet -- you never know what you'll need when you start putting it together. Your Jo Morton quilts are great. I'm not big on blue either, but I like this one a lot. Dawn, the 9-patches are wonderful. Whichever you choose to leave out of the front, just stick it on the back and incorporate it into the label...they're all too good to lose! 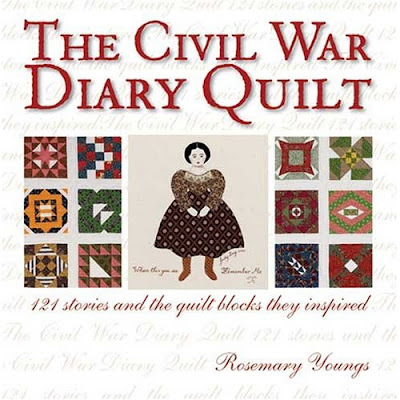 Love the Jo Morton quilts, too...so beautiful. Really love the blue one! I came here through a link somewhere. I love your quilts, they're beautiful! I'm a beginner quilter and am totally addicted to it! Great blog, I'll be back again. Beautiful work! Thanks for sharing these pictures. I agree with Tazzie and quiltpixie about the nine-patches, but also with Dianne - put it on the back! I would say the one I would remove would be the one on the right most column, fourth down (or second up, whichever way you see it LOL), it seems too light for the rest. 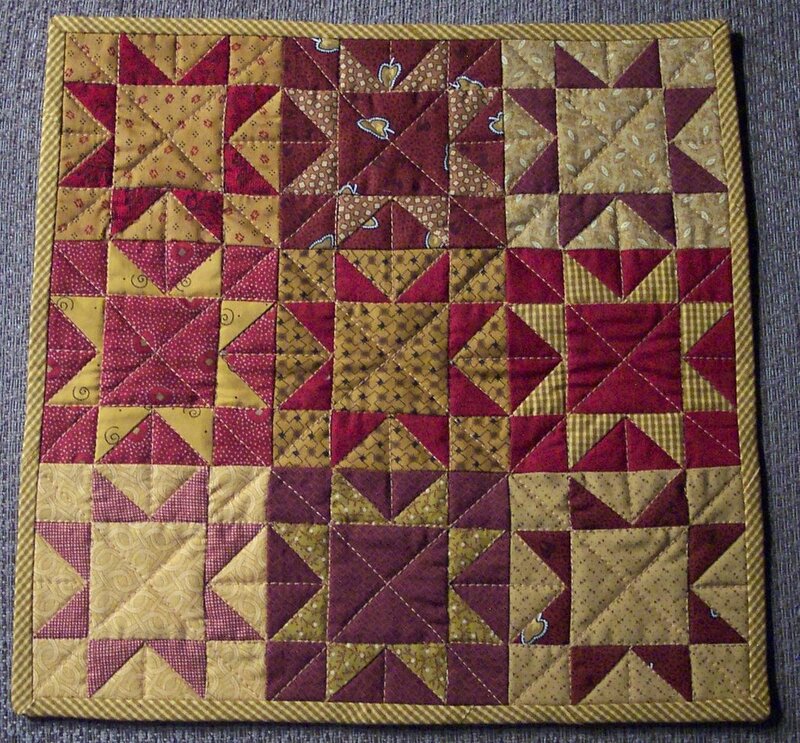 I love your Jo Morton quilts too, the red and cheddar one especially. Dawn, I love ALL your nine patches and your littles and your needlecase. you did a awesome job!! Hi Dawn, love the 9 patches...did you mention what size they are..? I don't remember seeing that...but I think they will be great with your special fabric. 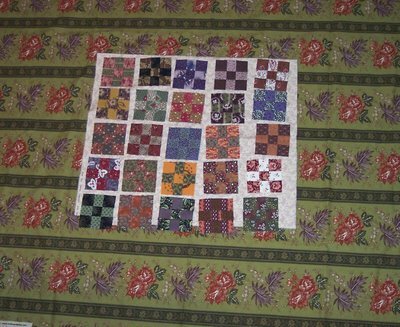 And your version of the Jo Morton quilts are great! I love them both! Dawn, your Jo Mortons are LOVELY. Go ahead and quilt the blue one, it is a honey. I don't use blues very often either. Your Churn Dash is just beautiful -- gently, quiet, but with some pizzazz also. Great Job! 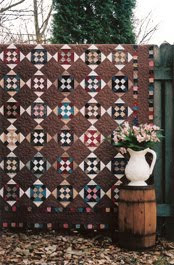 Love your Jo's quilts! I need to get busy on mine again. I"m back finally - but broke! Did a bit of sewing! I'm home - and tired!